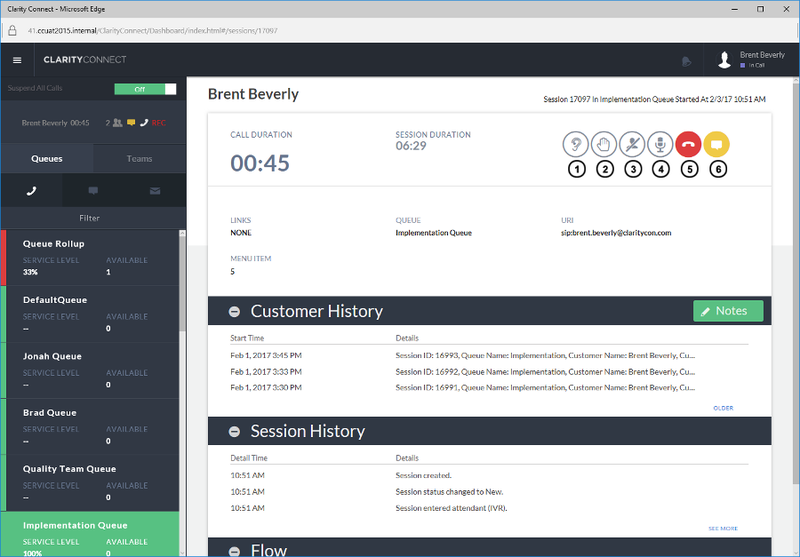 From the administrative website, click Dashboard on the main menu bar to view the Clarity Connect Console, which contains both the Dashboard view and Agent Console view. The Agent Console view gives users control over voice and instant messaging sessions. The Web Agent Console embeds call controls within the agent’s browser and thus has certain limitations. Before using the Web Agent Console, see 4.1 Agent Experience. In a federated environment where users are authenticating with different SIP and network login domains (ex: user@localdomain.com, user@hosteddomain.com), answering calls through the Skype-enabled Dashboard is not supported. Customers with this type of federated setup must use the local Skype for Business client and Remote Session Experience. See Agent Experience for more information. The agent experience may differ if sessions are answered in the Skype for Business client (remote session experience). See 4.1 Agent Experience for more information. Automatic log on with username and password is a requirement for Clarity Connect 4.0.10, 4.1, and 5.0. To configure automatic log on, see the Clarity Connect Knowledge Base. The Agent Console view allows agents to control voice and instant messaging sessions in the browser window. Agents have access to both the Agent Console and the Dashboard when accepting sessions, giving them the ability to monitor call center activity, manage presence, and answer and control calls and instant messages. As incoming sessions are received by the system, callers navigate through the call flow (see Call Flows for more information) and make selections before eventually being connected with an agent. Clarity Connect uses skills-based routing to assign calls to agents with the appropriate expertise rather than simply choosing the next available agent. When a call is routed to an agent, a visual alert displays on the Dashboard along with an audible ring. The agent can then either accept or ignore the incoming call. Once a call has been accepted, the Agent Console view replaces the standard Dashboard view, giving the agent access to call controls and details about the call. 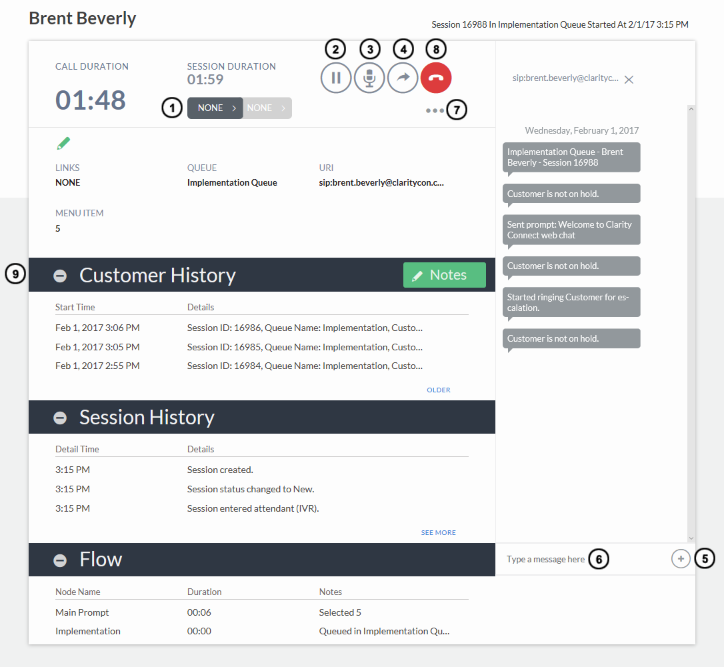 In addition to call controls, the Agent Console view displays session duration, URI information, details from third party platforms (if applicable), session history, customer history, the path the caller took through the IVR, and more. When the call ends, the agent has the option to perform after call work, which allows the agent to enter notes about the conversation and tag the session with keywords. When after call work is complete, the agent may be routed new sessions. The November 2016 cumulative update for Skype for Business is required in order to route audio calls to the Clarity Connect Console. Click the Menu icon (1) to hide the sidebar if it is already visible. Click the Menu icon a second time to display the sidebar. Enter a phone number, SIP address, or contact name in the direct outbound dial search box (2). A direct outbound dial may be placed to the selected result. A Cancel button allows the agent to stop the direct outbound dial. This feature is only available for agents signed into Skype for Business with Proxy Direct Calls? selected on the Agent Profiles page. Turn on Suspend All Calls (3) to set the logged on agent to Unavailable and prevent the agent from receiving calls. Turn off Suspend All Calls to set the logged on agent to Available, allowing the agent to receive calls. A session tile (4) appears for each active session the agent is handling. During an active session, it displays the agent’s name, the number of participants, the caller’s phone number or SIP URI, the session modality, the number of participants, and the duration of the session. Agents can click the session tile to navigate back to the Agent Console view after viewing queue and team tiles. The session tile displays a loading visual after the agent accepts the session but before the session is fully connected. Click the Queues filter (5) to display queue tiles in the sidebar. Click Filter (8) to modify the queues that display in the sidebar. Click the Teams filter (6) to display team tiles in the sidebar. Click Filter (8) to modify the teams that display in the sidebar. Click any combination of dashboard modality filters (7) to display those metrics on the Dashboard view. The Phone icon displays metrics for audio sessions, the Chat icon displays metrics for instant messaging sessions, and the Envelope icon displays metrics for email sessions. Click Filter (8) to display the Filter view, which allows users to select the queue and team tiles that display in the sidebar. For more information, see Dashboard. 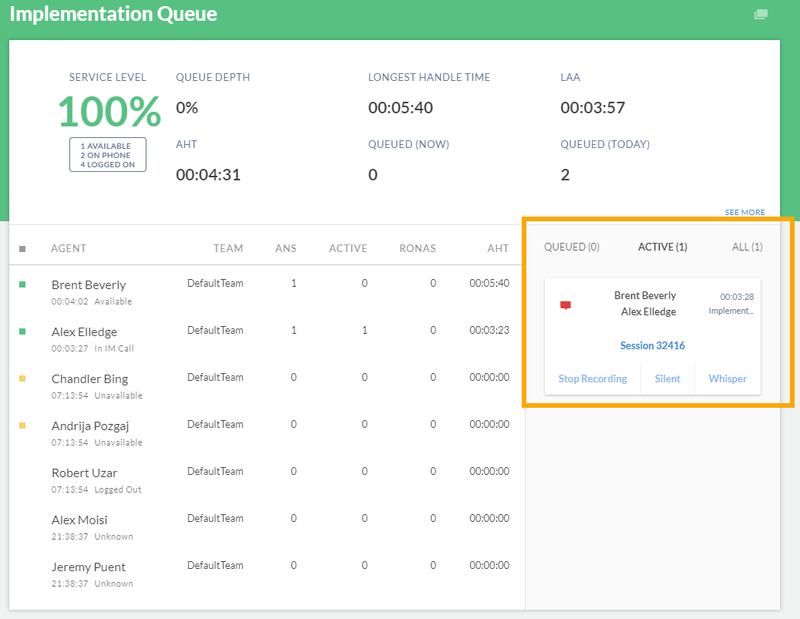 Click a queue or team tile (9) to display a Dashboard view with metrics specific to that queue or team. For more information on Queue and Team Dashboard views, see Dashboard. Use the Agent Console view (A) to control calls and instant messages, monitor session duration, view caller and session information, and view any third-party integration details. Click the Alerts icon (B) to view KPI alerts. For more information, see Alerts. Click the Audio Device icon (C) to configure an audio device. This icon only displays in Internet Explorer. Click the agent name (D) to view the Agent Summary Card. For more information, see Dashboard. When a session is routed to an agent, a visual alert displays on the Dashboard along with an audible ring. The agent may then either accept or ignore the incoming session. Once a session has been accepted, the Agent Console view replaces the Dashboard view, giving the agent access to call controls and details about the call. If it is an instant message session, the chat window will also display. The session tile (Figure 1, bubble 4) displays a loading visual and then populates with information when the session is connected. The agent has access to session duration, URI information, details from third party platforms (if applicable), session history, customer history, the path the session took through the IVR, and more via the Agent Console. When the session ends, the agent has the option to perform after call work, which allows the agent to enter notes about the conversation and tag the session with keywords. When after call work is complete, the agent is marked available to accept a new session. For more details, see Perform Session Control Actions below. Reference Figure 2 to view labeled session information on the Agent Console view. Session Extra Item information may also appear in this section, which can be hidden from view, if desired. This is the unique ID assigned to the session. The session’s queue, start date, and start time are included. System messages describing the state of the session display under the session ID. To view additional system messages, hover the pointer above the current system message. The last few messages will appear when hovering over the current message. See Appendix: System Messages to view a complete list of system messages. This is the incoming phone number, SIP URI, or contact name of the audio or IM session. This is the total time the caller or IM session participant spent speaking with the current agent. If the session is transferred to an agent, queue, or contact, the Call Duration timer resets. This is the total duration of the session, including the time the caller or IM session participant spent speaking with an agent and any time spent waiting to speak with an agent. If the session is transferred to an agent, queue, or contact, the Session Duration timer does not reset. When an integration package is enabled, the Agent Console pulls information from the third-party platform and presents it during a session. Depending on the integration, different information may display here. Clarity Connect has the ability to integrate with third-party platforms. This allows Clarity Connect to take advantage of the capabilities of the third-party tool, such as creating or retrieving data from the third-party component. For more information, see Third-Party Integration. In addition, one custom URL can be displayed here using the Set Screen Pop URL node. For more information on the Set Screen Pop URL node, see Call Flows. This is the name of the queue the session came in through. This is the URI of the session. When an agent accepts a session, the Agent Console view replaces the Dashboard view. The icons in Figure 3 allow users to control sessions. Depending on the configuration and state of the session, different icons may display here. Hover the pointer over an icon to view tool tips. Click the Disposition icon to assign a primary keyword to the session. Click the Sub-Disposition icon to assign a secondary keyword to the session. Dispositions and sub-dispositions can be added during or after a session. Select Require Disposition on the Agent Profiles page to require a specific agent to select dispositions for each session. Click the Hold icon to place the caller on hold with music or place the IM session on hold with messages. Click this a second time to take the caller or IM session participant off hold. While the audio or IM session is on hold, the Hold icon turns yellow and a timer displays the number of seconds the session has been on hold. If the session is on hold longer than the preset threshold, the Hold icon flashes red. Hold thresholds can be configured on the Queues page. Click the Mute icon to mute the session and prevent the caller from hearing the agent. Click the Mute icon a second time to unmute the session. The Mute icon only appears during audio sessions. Click the Transfer icon to transfer the call to another agent within your organization, consult with another agent while the customer is on the line, or bring an additional agent into the call with the customer. Agents that receive a call this way will have access to the full Agent Console, and their time spent on the call will be included in Clarity Connect call metrics. Contacts, or individuals not configured as agents in Clarity Connect, will not have access to the Agent Console when transferred a session. Clarity Connect provides operator support. To immediately display transfer options when a call is answered instead of standard session information, select the Operator box on the Agent Profiles page. A search box will appear after clicking the Transfer icon. Use this search box to find agents, contacts, or queues. Click the Pin icon to save agents, contacts, or queues. Agents' Skype for Business statuses are reflected in searches and pinned items. A refresh button above the pinned contacts will update the contacts' presence. Pinned items appear under the search box (but not while performing a search) in all future sessions until unpinned or until the browser cache is cleared. You may search for agents or contacts by name or phone number. Pinned contacts do not show up for agents using Remote Session Experience. To view pinned contacts during Remote Session Experience, sign into Skype for Business via the Clarity Connect Console or use Skype for Business transfers. Transfer allows the call to be transferred to the new agent if he or she is available to take the call. The current agent will remain on the call with the customer until the new agent answers. Invite brings the new agent into the conversation with the customer, after which the current agent can either eject or transfer the call to the new agent. Consult allows the two agents to speak alone while the caller is placed on hold before either bringing the other agent into the call with the customer, transferring the call to the new agent, or returning to the call with the customer without the new agent. VM transfers the call immediately to the new agent’s voice mail without ringing the agent. VM is not available for external phone numbers or for agents or contacts that do not have voice mail configured. Transfer immediately ejects the current agent from the call and places the customer in line for the new queue in the position the customer would be in had he or she initially been in that queue upon connecting. Consult finds an available agent with the necessary skills for the selected queue and allows the current agent to speak with the new agent (if desired) before either bringing the other agent into the call with a customer, transferring the call to the new agent, or returning to the call with the customer without the new agent. Click the Instant Message icon to display the chat window. When the chat window is not open, the session tile chat icon flashes to indicate a new instant message. An IM prompt is pre-configured text that an agent can send to an IM session. Click the IM Prompt icon and select a prompt to insert into the chat window. Prompts may be edited before sending. See IM Prompt Maintenance for information on how to configure IM prompts. Enter text in the chat window to send instant messages. To view chat transcripts from previous sessions with the customer, click Load More at the top of the chat window. To send a transcript to an email target, click the Ellipsis icon at the top of the chat window. Enter an email address in the field and then select Send Transcript. Transcripts will only be sent after a session has ended. Transcripts can also be sent to an email target via the Session Search page. Note that if a transcript has already been sent to an email target via the Clarity Connect Console, that transcript can only be resent from the Session Search page to the original email target. Click the Ellipsis icon to display additional call controls, including the Escalate icon. Click the Escalate icon to escalate an IM session to an audio session. This icon only appears during IM sessions. Voice sessions are stored as audio recordings, and IM sessions are stored as transcripts. All recordings are saved on the Session Search page of the administrative website. IVR level: always record or never record calls in the IVR. See Configuration Settings for information on managing this setting. Node level: Use the Set Block Recording node to start or stop recording as a caller traverses through the call flow. This rule takes precedence over the IVR level recording rule. See Call Flows for information on using this node. Portal level: record a set percentage of all incoming calls to the portal. See Configuration Settings for information on managing this setting. Queue level: always record or never record a queue. This rule takes precedence over the portal level recording rule. See Queues for information on managing this setting. Agent level: always record or never record a specific agent’s calls. This rule takes precedence over the portal level and queue level recording rules. See Agent Profiles for information on managing this setting. Agent Console level: if the Record and Stop Recording buttons are visible on the Agent Console, the agent can control his or her call recordings as desired. This takes precedence over the portal level, queue level, and agent level recording rules. The Record and Stop Recording buttons can be hidden from the Agent Console if supervisors do not want their agents to have access to them. Click the Hang Up icon to end the current session and begin after call work. Supervisors, as well as certain additional Clarity Connect roles, can manage sessions from the Active tab in the Queue or Team Dashboard view (Figure 4). The ability to manage sessions from the Active tab in the Queue or Team Dashboard view is controlled by the user's assigned role. By default, QA Monitor, Team Lead, Supervisor, and Administrator roles have the ability to manage sessions in this way. See Roles for more information. Clarity Connect uses Authorizations to determine which sessions the above roles have the ability to join. If the Active tab doesn't display the expected sessions, ensure the user has the ability to monitor the queue or team that contains those sessions. For information on four party calls, see Appendix: Four Party Call Behavior. From the active session card, click the Session ID to navigate to the Session Search page. Supervisors have access to Silent and Whisper join from the active session card. Clicking either of these options opens the supervisor Agent Console view while either silent or whisper joining the selected session (Figure 5). If they have the necessary permissions, supervisors can also control session recordings from the active session card. Click the Whisper Join icon to be heard only by the agent upon joining the call. The agent will be notified when a supervisor whisper joins so he or she won’t be surprised when hearing a new voice on the line or seeing the supervisor’s IMs. The supervisor will also be listed as a participant in the call on the session tile in the sidebar; silently joined supervisors will not be listed here. If a supervisor is joined to a session, and the agent (session owner) transfers the session, the supervisor will be removed from the session. Click the Barge In icon to notify all conversation participants the supervisor has joined the call. The supervisor will be seen (in a chat session) or heard (in an audio session) when this icon is selected. Once the supervisor has joined a session using the Barge In icon, he or she will not have the option to use the Take Over functionality. Click the Take Over icon to join the call as a full participant and session owner. After taking over the session, the Eject Agent icon appears. Click the Eject Agent icon to remove the agent from the session. Because the supervisor owns the session, clicking the Hang Up icon will end the session and disconnect the caller. As a session owner, the supervisor also has the ability to transfer the session to a different agent or queue. Click the Mute icon to mute the session and prevent the caller from hearing the agent. Click the Mute icon a second time to unmute the session. The Mute icon only appears during audio sessions. Click the Hang Up icon to disconnect from the current session. Unless the Take Over functionality is used during the entire session, Hang Up will only disconnect the supervisor from the session. It will not end the session between the agent and caller. Click the Instant Message icon to display or hide the chat window. The Agent Console view contains three expandable context tabs. Detail Time indicates the start time of the session. Details include notes from past sessions. Click a session ID to display additional details, including queue name, customer name, customer phone number, modality, disposition, and sub-disposition. Detail Time indicates the time the session status was updated. Details include all available information about the previous session, including any dispositions and notes, if applicable. Click Notes to enter session details in the notes box. Notes are saved with the call in Clarity Connect and appear when searching past sessions. Notes can also be added during after call work. Select Require Call Notes on the Agent Profiles page to require a specific agent to enter session details for each session. Node Name indicates the name of the node the session traversed through. Duration indicates how long the session spent in that particular node. Notes detail selections the caller made in that particular node. After a session ends, the Dashboard displays the After Call Work view, which allows the agent to modify the disposition and sub-disposition, add notes on the session, and review any session details (Figure 6) before being marked available to accept the next session. This timer follows a pre-configured after call work period and counts down to the next potential session. Click the Notes icon and enter any session details in the notes box. Notes are saved with the call in Clarity Connect and appear when searching past sessions. Select Require Call Notes on the Agent Profiles page to require a specific agent to enter session details for each session. Click the Hourglass icon to extend after call work. Clicking this places the agent in manual after call time and changes the agent’s presence to Busy. Click the Finished icon to complete manual after call work and return to an Available state. During a four party call, the Transfer and Remove Participant controls are located in the session tile. 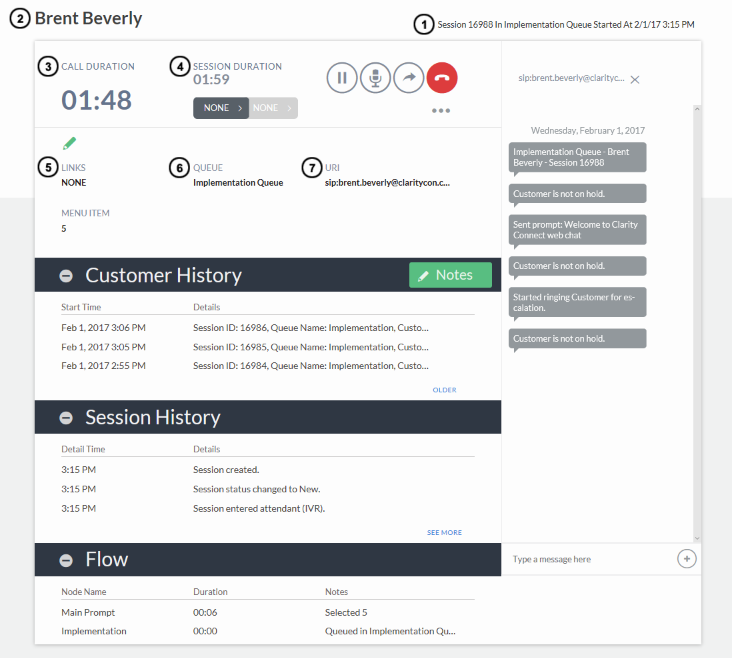 Clarity Connect detects a four party call when a customer, agent, invited or consulted party, and a supervisor are simultaneously connected to a session. If a supervisor is whisper joined to a four party call, the agent (primary session owner) can transfer or eject the consulted party. If a supervisor is silent joined to a four party call, only the supervisor will see the four party call. The agent (primary session owner) and invitee will not see the four party call. If a supervisor barges into a session, making it a four party call, the agent (primary session owner) has the ability to transfer to the supervisor or the consulted party. If a supervisor whisper joins or barges into a session, making it a four party call, the agent will not have the ability to remove them. If a supervisor is whisper joined or silent joined to a four party call, the supervisor will see a list of participants in the session tile on the side bar and will have access to standard call controls. If the supervisor uses the Take Over functionality in this scenario, the former primary session owner (agent) will be disconnected if the supervisor performs an invite or consult. RONA Error RONA Notifier <CurrentDateTime> - You have missed a Call. Toggle your presence back to available to begin receiving calls again. Okay For RONA notifications Connect will present a notice to both the Dashboard and the Skype client. Default Error Notify Error An Error has Occurred NONE Okay This is the catch all error message and should only be presented if something severe or unexpected happened. Participant Did not Answer or Declined (Invite/Consult/Warm Transfer) Info Participant Unavailable The requested participant is not available at this time. Please try again later. Okay This is the message that occurs when a VM is not available.